If you have any questions about the Aldabra information page below please contact us. Motor Yacht Aldabra is a 22.65m superyacht built by the French shipyard OCEA launched in March 2011. Superyacht ALDABRA is an OCEAN Classic 72 model designed for extended cruises to the most secluded places, with a reinforced hull for ice navigation. Her naval architecture is by Joubert/Nivelt. Aldabra yacht offers accommodation for 6 guests in one Owner's stateroom and two guests staterooms and her crew quarters are designed for two. 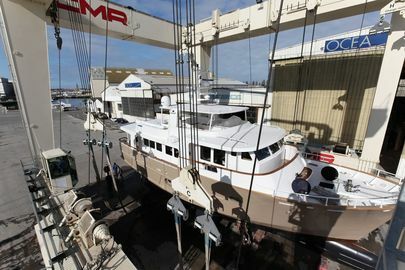 The aluminium hull yacht measures 22.65 metres in LOA and has a beam of 6.45 metres. 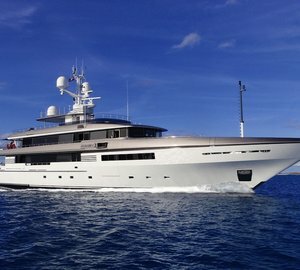 M/Y Aldabra is powered by twin Cummins QSL 9.0 rating HD330 mhp engines powering her to a maximum speed of 9 knots and a range of 3 800 nm @ cruising speed. Aldabra can accommodate a maximum of 6 guests in 3 cabins. We do have available further amenity, owner and price information for the 22.65 m yacht Aldabra, so please enquire for more information. 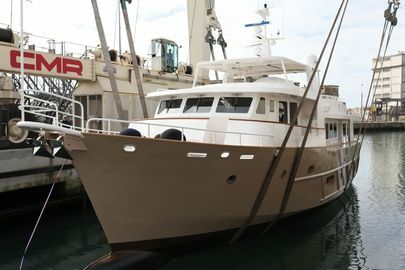 The luxury yacht Aldabra displayed on this page is merely informational and she is not necessarily available for yacht charter or for sale, nor is she represented or marketed in anyway by CharterWorld. This web page and the superyacht information contained herein is not contractual. All yacht specifications and informations are displayed in good faith but CharterWorld does not warrant or assume any legal liability or responsibility for the current accuracy, completeness, validity, or usefulness of any superyacht information and/or images displayed. All boat information is subject to change without prior notice and may not be current.